Toyota's single GT86 will have a crew of four, led double British Touring Car Champion Chris Hodgetts, backed up by his son, Stefan, evo magazine's Richard Meaden and historic sports car racer and Travis drummer Neil Primrose. They will be competing against arch rivals Mazda whose MX-5 GT production race car has a similar power output. 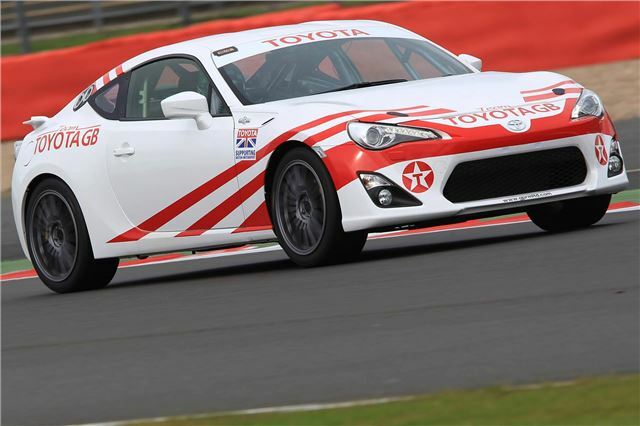 The Hodgetts gave the Toyota GT86 a shakedown test at Silverstone last week. More fine-tuning is scheduled for Wednesday, when Meaden and Primrose will drive the GT86 for the first time, ahead of Friday’s official qualifying for the Britcar 24 Hours, the only round-the-clock race held in Britainfor sports and GT cars. The GT86 has been built in Buckingham's GPRM race preparation workshops which also developed the Toyota Avensis ‘Next Generation Touring Car’ BTCC concept. Transformation from road car to race car went smoothly, says GPRM’s Gary Blackham. Hodgetts, now 61, was the BTCC victor in 1986 and ’87 in a Toyota Corolla GT. He has not competed for 13 years and last raced a Toyota in 1988, but kept up his racing licence and is on track nearly every day as an instructor. Powered by a 16-valve double overhead cam horizontally opposed ‘boxer’ engine delivering 200PS, the Toyota GT86 captures some of the best elements of three models from Toyota’s rich sporting heritage: the Sports 800, 2000GT and Corolla GT (AE86). It went on sale in the UK to critical acclaim at the beginning of July. Team Toyota GB earned fame in the 1980s and ’90s thanks to championship victories with the Corolla in the British Touring Car Championship and UK rallying. The team’s last appearance was in the BTCC in 1995 with the Carina E raced by Julian Bailey and Tim Sugden.